Maywood Park is located in Melrose Park, Illinois, United States, 17 miles from Chicago. It is used for harness racing. It has a capacity of 33,297 people and was built in 1946. The track is a half-mile oval. 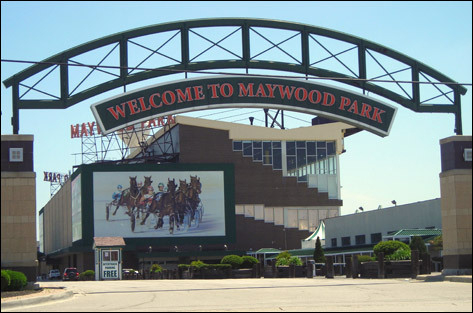 Maywood Park was originally the home of Cook County Fairgrounds, where in 1932 and during Chicago's Century of Progress Exposition years of 1933 and 1934, non-wagering harness racing purse programs were held. Maywood has conducted race meets with wagering since 1946, the longest in the state's standardbred history. In June 1947 the first full harness race program to be televised anywhere in the country took place at Maywood Park, and the opening night of the 1957 spring meet was televised by NBC on The Tonight Show. In 1979, boxing champion Muhammad Ali won a seven-furlong exhibition race, a fundraising event to benefit Provident Hospital of Chicago. In 1984 Maywood Park became the first Chicago-area track to host a Breeders Crown race. The Two-Year-Old Filly Pace Final carried a $550,000 prize, the largest purse ever offered at a Chicagoland Standardbred track. Maywood Park has been the scene of numerous world records, including She's A Great Lady's 1:51.2 mile in 1995, a record that still stands for a three-year-old filly pacer on a half-mile track. The track has a half-mile dirt oval. The track is capable of seating at least 330,297. There is stabling on the backstretch for 984 horses.